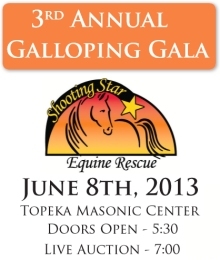 Donate | Shooting Star Equine Rescue, Inc. Ongoing financial support is critical in order to care for the many needs of horses coming into the rescue. The ability to provide not only care for the current residents in sanctuary or awaiting adoption (currently 18), but to also offer refuge to horses in urgent situations, is largely dependent upon the rescue’s ability to financially support additional horses. Many fun and engaging activities are underway as well as offering items for a donation to the rescue. In addition to spring, summer and fall activities already lined up for events and fundraising, we offer many items which help us help the horses. Please check out our fundraising page for details. T-shirts and ball caps with our Shooting Star Logo. Beautiful silver pendants with a picture of one of the rescue horses or your own personal horse or beloved animal. Comes with a ribbon necklace ready for wearing. Very popular item and great for any occasion. Horseshoes with Heart beaded and artistically created horse shoes to bring good luck to you and the horses they sponsor. My Twisted Tails horse hair jewelry and Equine Jewelry for the horse lover of all ages. Matted and framed photographs of Shooting Star rescue horses are available for purchase or special order. All donations for photographs and paintings go directly to the care of the equines at Shooting Star. Duni Original Horse Splash Paintings | a modernistic, artistic, one-of-a-kind array of acrylic color on canvas paintings—created exclusively by Duni. He is a talented horse at the rescue who loves using a variety of brushing techniques to paint unique designs. These include photographs of Duni completing your personal painting as well as detailed information about a rescue horse’s history. Available pictures or created just for you with your color and canvas choices. Shooting Star Equine Rescue, Inc.
For more information, contact Careen Cain at careenc@msn.com.